Yesterday, after updating to iOS 7 most people were faced with a harsh reality: they have thousands of unread emails that lay deep in the bottom of their Gmail inbox that they never knew about. iOS 7 changed the way it interacted with Gmail. Before, it used to be that your Mail icon would only keep track of the most recent emails you received and tell you with a little red icon how many emails are unread. After yesterday, when updating to iOS 7, the Mail icon can now see all unread emails in your inbox, even if those emails are from 7+ years ago. It’s meant to be a benefit, but for some it will be an annoyance for sure. There is a fairly simple fix for this problem in Gmail. It will require you logging into your Gmail account on the web at http://www.gmail.com/ and typing in your gmail email address and the gmail password. then hit return/enter or click on the adjacent magnifying glass. Please note that this how you accomplish this with Gmail. The process/method is different with other email providers like AOL, Yahoo, Hotmail, etc. Also note that you would need to do this on every Gmail account you have setup on your iPhone, iPad, iPod, etc. If you have multiple email addresses with Gmail that you use, each one may have buried unread emails causing your Mail icon to show the red badge. Ask questions in the comments or email me directly through my contact page. Having grown up in the DC area, I have become accustomed to the sheer disaster that is rush hour traffic in the area. My clients are located all over the DC area, so I take to the streets more than most and have to constantly invent new ways of getting around to try and avoid clogged highways and bumper to bumper back-roads. I have long searched for the best traffic app for iPhone… I’m hapy to report my search is over. It’s called Waze (pronounced “Ways”). Waze is built on the idea that traffic reports from your neighbors are just as good as those provided by the newscasters or those little sensors that you’ll see on major highways. Millions of people turn the app on and then drive to work, school, home, run errands, etc. and as they drive, the App tracks the speed of the driver using the App and records it in the cloud. Not only that, but you can see reports of road hazards and even speed cameras and police sightings. No more waiting for traffic and weather on the 8s. For example, when 50 people using the app are driving south down I-270 at 55 mph and the 25 driving 5 miles ahead of you slow their speed from 55mph down to 15 mph, the app makes a very logical assumption that there’s traffic building up ahead of you. It will first alert you that you’re new eta is 10 minutes later than it was when it first calculated your route. On the map, you’ll see there is a red band where the traffic has slowed down and, if it can save you time, the app will suggest you take a different route to your destination. 1. I find the fastest route, every time. Since I began using this app, I ask for turn by turn navigation every time I get in the car… even if I already know how to get there! By doing so, I can be sure that Waze is calculating the absolute best route for me to travel down based on traffic reports happening in real time. It brings a smile to my face every time the app tells me I should take back roads because of huge accident on 270. It really is remarkable how accurate the system is. 2. I find the cheapest gas along my route. A little known fact about Waze is that you can acutally find a list of the closest gas stations and prices of each fuel grade as reported by other people using Waze. If you are currently following along a route, it will show you gas stations along the route and if you are just freestyling, as I like to call it, then it will show you the cheapest gas closest to your location. 3. I don’t get tickets anymore. Although I don’t like to admit it, Waze saves me regularly from getting speeding tickets on the ICC. I have been known to have a tiny bit of a lead foot because I do mostly highway driving in the area, but if you’ve driven on MD-200, you know how often there are speed traps and hidden cops along that highway. Waze alerts me a mile beforehand of any speed traps or police hiding under overpasses and allows me to adjust my speed. Sometimes its a false alarm and the officer has already moved on, but it’s always better to be safe than sorry. 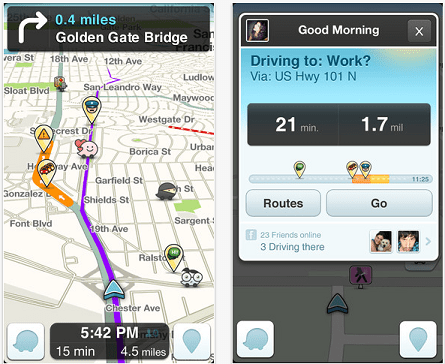 Some other cool features of the App are that you can have Waze send someone a link to your real-time ETA. If you’re meeting up with someone, it can be really helpful to let them know how far away you are and have it update them with any change in traffic or route. They can’t see you on a map, but they do know what time to expect you. Best of all though, would you believe it’s totally FREE? Besides the fact that Waze was recently acquired by google for over $1 billion, they make some some revenue by showing you an occasional ad when you’re not driving. You can sign up using a Facebook account or just remain an anonymous wazer. I encourage you to download this app from the App Store on your iPhone. To any of my clients reading this, contact me and you can ride shotgun with me and see a demonstration of how Waze can save you money and time on the treacherous DC roadways. © 2013-2019 Mike Wish. All rights reserved.